Description: The Fleur de Lis is a well known historical symbol seen in European Coat of Arms, military emblems, flags, coins, and more. The Lilly Flower was often used to represent a specific royal family, and each one differs slightly. 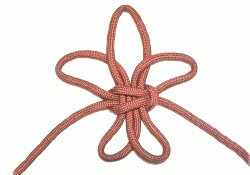 To mimic the ancient design, this decorative knot has several loops representing the petals, which are held together by a Square Knot. 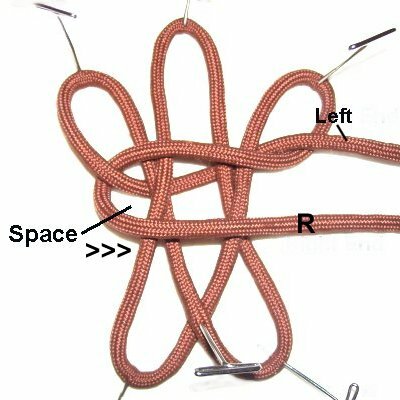 Nylon Parachute cord was used in the example, since it holds the shape of the knot fairly well. You can also use waxed material or leather, which will help you create the proper shape. The loop at the top center should have a point, and the remaining loops should be curved outward slightly. 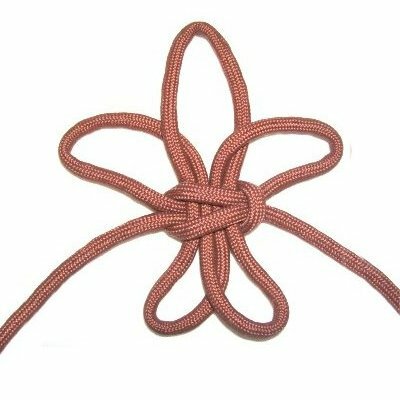 I found this knot on Fusion Knots. The design shown on this page has been changed slightly from the original. 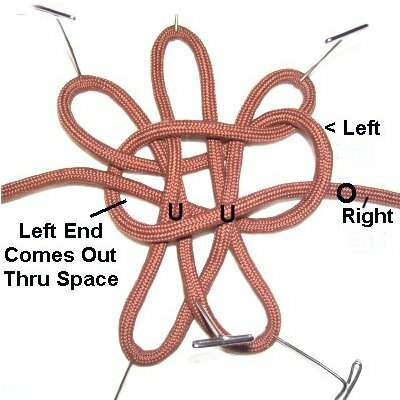 The video gallery has tutorials for other interesting knotting techniques and designs. Step 1: Fold a 24-inch cord in half and secure it at the center. 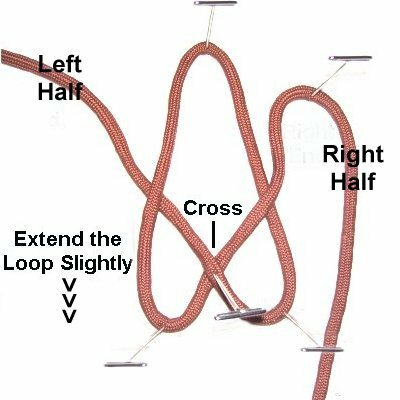 Make a loop, so the left half crosses over the right. Step 2: Use the portion that's now on the left. 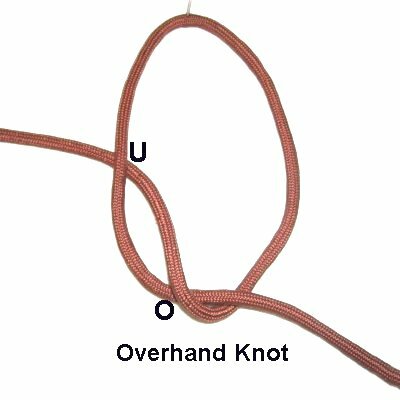 Bring it through the loop over - under, to make an Overhand knot. Move both ends to the top before moving on. Step 3: Extend the knot forward, so you can clearly see the crossed area and the two loops at the bottom. Secure the three areas. Mentally label the two halves of the cord where they are resting now. Curve the right half forward. Step 4: Move the right half to the left, rotating clockwise to form a loop. The right half of the cord should pass over everything in it's path as you arrange it horizontally. Step 5: Use the left half to make the next loop. Bring it forward, passing over the right half. Make sure you secure it at the top where it curves. Step 6: Move the left half under all the segments as you bring it to the right. 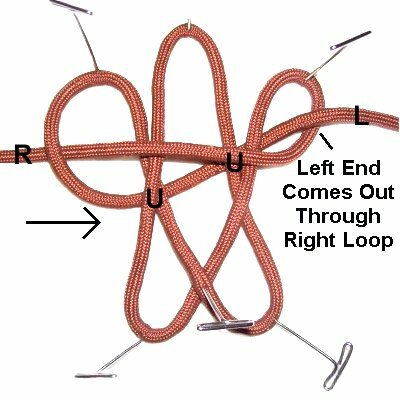 Pull the left end out through the right loop. Step 7: Move the right half of the cord to the right. Pass it over all the segments in it's path. Note that there is a space just below the left loop, where the right half curves. Step 8: Pass the left half over the right half, as you prepare to bring it back to the left. Move it under all the segments in the center, and bring it out through the space near the curve. Step 9: To tighten the Fleur de Lis knot, pull on both ends to tighten the Square knot. 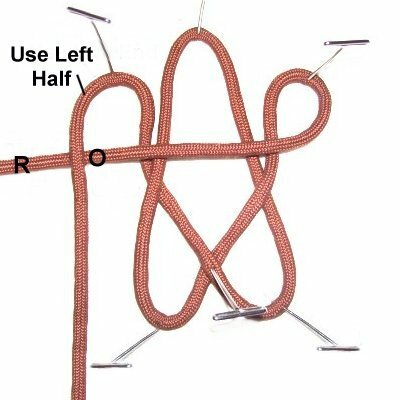 Reduce the size of the lower loops by pulling on the upper ones. 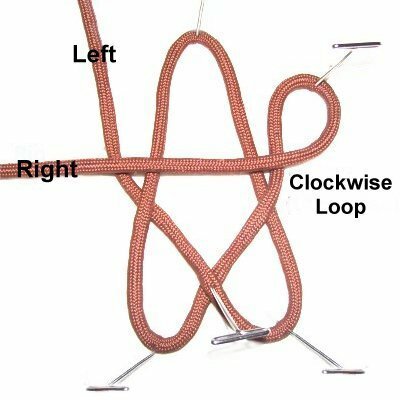 The two loops at the top right and left should be large enough to curve outward. 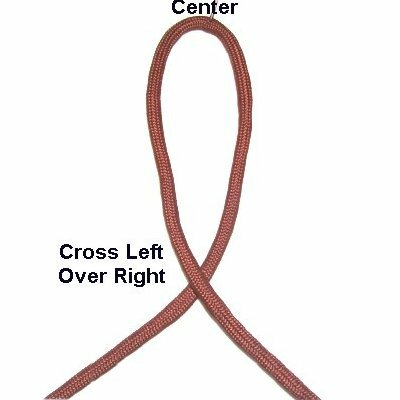 The center loop should be slightly pointed. Have any comments about the Fleur de Lis? Contact Me.